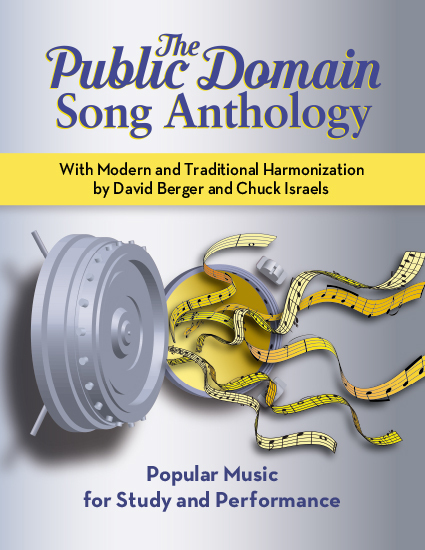 I was thinking about titling my new book of public domain songs Songs My Mother Sang to Me. My mother was born in 1924, so all this music was written before she was born. I might have called the book Songs My Grandmother Sang to Me, but I don't remember her ever singing. If she did sing, though, she would also have known these songs. There is nothing unusual about my family—every American for generations knew these songs. It's part of our American heritage. At least, it used to be. As a child, I listened to children's records of many of these songs. Staring in nursery school (what we now call preschool), we learned to sing them. This went on though elementary school. We even had to memorize all four stanzas of the Star Spangled Banner in music class along with learning dozens of folk songs, some classical music and the rudiments of reading and writing music. All this laid the foundation for a life of understanding and enjoying music at the very least, or in my case, a career in music. These songs tell us the American experience from songs immigrants brought to our shores, to the frontier experience, to the Gilded Age, World War I, and finally the start of the Jazz Age. To this day, we encounter many of these tunes in movies and cartoons. For those of us that know the references, there is a deeper appreciation of the art at work, much the same as literary and historical references. Not all these songs contain politically correct lyrics. America has a long history of racism, religious intolerance, sexism, and xenophobia. We included a few such lyrics because of the extreme fame of these songs and the wonderful music that accompanies the cruel and insensitive lyrics. Besides, scrubbing history dooms us to repeat it. Personally, I wouldn't perform the lyrics to Swanee River, but to not know this well-known and influential song would be a critical lapse in one's musical education. Without knowing this popular minstrel song, how could you appreciate Ray Charles' 1957 recording or Sy Oliver's 1935 classic arrangement written for the Jimmie Lunceford Orchestra? Sy later wrote an arranging textbook in which each musical example used a fragment of Swanee River. And how could you appreciate The Honeymooners episode where Ralph appears on the $99,000 Answer? Minstrel shows were the beginning of American show biz. They led to vaudeville, operettas and musical comedy. To understand American theater, one must know and embrace Minstrelsy for what it was—Black performers appealing to white audiences using all the tools they had. They invented American music, dance and humor. The unfortunate part—the part that makes us squirm now—is that they needed to degrade themselves and their race in order to please their racist audience. The vestiges of this racial degradation persist to this day throughout our culture. Other recent immigrants to America were likewise made fun of and denigrated in song. Curiously enough, few of those songs were good enough, or historically important, enough to survive until now. Jews, Italians and Irish got their share of ethnic songs, often written by one of their own. Several songs in this collection expose the bias against Asians that persisted in America, but mainly they refer to their status as “the other” and living in ghettos (Chinatown), whose names survive to this day. Native Americans and Mexicans have also faced their share of discrimination in song, but few of those have survived. The objectification of women is pretty rampant throughout much of this material. Even when nice things are said about women, it is about their superficial looks or in some way condescending. Remember that women did not get the vote in our country until 1920. The great majority of these songs predate their suffrage. My advice is to be kind to our forbearers. Consciousness is an ever-evolving process. I assure you that future generations will likewise have serious issues with our treatment of each other. All this leads to the value of this book for musicians. By musicians, I mean both amateur and professional singers and instrumentalists. Knowing and performing these songs teaches us how to create good melodies, either writing or performing, on the most basic level. These are the songs of the people—ordinary people, not professional musicians. We sang them in summer camp, either around the campfire or in the mess hall after lunch. I can trace my own understanding of harmony and melody to this repertoire. Centuries of tonal music have created musical associations in our brains. We react to melody notes and chords in the way that Americans have been reacting for over a century—major thirds sound happy, minor thirds sad, dominant seventh chords are unstable and need to resolve, major seventh chords are sophisticated, the ivm is the chord of despair, and so forth. These associations cause us to have emotional reactions to music. Without them, we might as well be speaking a foreign language—it sounds nice, but I have no idea what they are talking about. Although not outright sexual, there are some double entendres and sexual references in one or two cases bordering on bawdy. Surprisingly, some of these appear in nursery rhymes and folk songs, while the more subtle double entendres appear in some of the blues lyrics. I don’t find any of these to be offensive, but they may not be appropriate for children. I would like to say something about how this book came about, and the kinds of editorial decisions that we have had to make, but first let me explain how the Public Domain came into being. Before 1790 everything was in the Public Domain. There were no copyrights or patents. Congress enacted the copyright and patent laws to protect creators from having their work used by others before the creators could reap sufficient financial rewards to support themselves. The theory was that if a professional musician can protect his work for a period of time and be the sole monetary beneficiary of the work, he/she will then have more time to devote to his/her art, and therefore be able to create more and better product. Initially, copyrights lasted 14 years. Limiting copyrights and patents would prevent the establishment of landed gentry, as existed in England. In actuality, we already had landed gentry, as a list of America’s richest citizens will expose. Many of them became president (Washington, Adams, Jefferson, and Madison for starters), vice president or members of Congress. Later on, the term limit was doubled to 28 years, which could be renewed for another 28. This was considered long enough to support an artist for his or her entire life, and remained in force for generations. By the 19th century, publishers got involved in the distribution of sheet music and received half the royalties. Publishing companies became incorporated. Corporations don’t die. Even if they go into bankruptcy, their assets are assigned to other corporations. For decades, corporations pushed to extend copyright protection. Most famously the Walt Disney Company got Sonny Bono to sponsor a bill that would keep Mickey Mouse (and everything else) out of the public domain indefinitely. The public domain was frozen at 1922 until this year (2019), when finally, 1923’s songs entered the public domain. Next year (2020) we will get 1924’s songs, and so forth. This book celebrates this rich gift to the American people. As you can imagine, there were many thousands of songs written since man uttered his first sounds about 160,000 years ago. Very few are good enough to survive more than a generation or two, let alone a century or a millennium. The oldest song in this anthology is Greensleeves, which dates from about 1580. Other songs, like Scarborough Fair, have roots from around the same period, but evolved over the years. The criteria used in choosing which songs to include were the continued popularity of a song and its musical quality. For instance, there could be a song that was excellent, but was only performed once, or conversely there could be a song that was very popular, but is weak musically—neither of these cases would be worthy to include. Some songs from shows became popular, while most of the other songs in those shows got little to no play outside of their original show. Long form compositions have been excluded. This included classical music, marches, waltzes and early jazz pieces written in march form. Short verse/chorus songs (as found in most folk music) are included in their entirety, while we have omitted the verses that were separate from the refrains in what became known as the American Songbook. So My Darling Clementine will contain its inseparable verse (you can’t possibly perform this song without the verse), while the verse to April Showers has been omitted. The refrain stands by itself, while the verse is rarely, if ever, performed. Blues songs present a problem in that they often include several choruses of different music as well as other non-blues structure sections. In the case of longer form blues, such as Royal Garden Blues, we have chosen to omit them. We have included other blues pieces that have an identifying chorus and are performed without other material. The one exception is St. Louis Blues. It contains several sections, and is always performed in its entirety. This blues is so iconic; we are compelled to include it. Another issue is alternate lyrics and lyrics to additional verses. Rather than including this information alongside the music, we have made these lyrics available as an addendum only available online. Many of the songs in this collection evolved over the years (melodically and/or lyrically). We have chosen the versions that are the most artistic and fall within the boundaries of the Public Domain. Therefore, a song like The Yellow Rose Of Texas, which most Americans know from Mitch Miller’s 1955 hit recording, began its life as a minstrel song with somewhat different lyrics. 1955, being well beyond the 1923 threshold, disqualifies the Miller version’s lyrics. The original minstrel version is included along with suggestions for alternate lyrics to avoid racist language. Aside from learning the songs in this collection and performing them, this is a treasure trove for composers and arrangers who will want to use this material in a creative way. By keeping the words and melodies pretty much intact, there are great possibilities for creativity in the rhythm and harmony. Since rhythm is pretty instinctive to most people, and harmony is more esoteric, we have included the original harmonies for each song as well as some suggestions for more modern chord changes. You will find Chuck Israels’ and my harmonies in italics above the original chords. The idea isn’t so much that our suggestions be the only way to make these songs relevant to today’s ears, but to show some possibilities that will encourage others to find their personality in these old songs. If, however, anyone wants to use any of the material in this book, it is free with no restrictions. The entire book and additional lyrics will be available online at at no charge. If you or anyone else would like to purchase a hard copy, you can do so at www.SuchSweetThunderMusic.com. In either event, all these songs may be performed live or recorded with no restrictions or payments to rights organizations like ASCAP or BMI. New performers and/or arrangers may make their own copyrights of their versions. The added benefit of performing these beautiful songs is the audience’s instant recognition. For those who grew up with this music, they already love these songs and will respond to new performances and renditions just as previous generations have. This is the gift given to us. It is incumbent on us to pass it down to the next generation, so they can fully appreciate what it is to be an American. Naturally, an individual use income for is basically up you r.
Could possibly also add extra security with new doors and windows.